This Announcement/Meeting Reminder/Election Notification/Warning is the most significant and important email message you have ever or will ever receive! 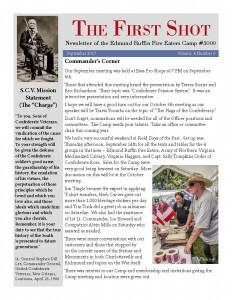 The Edmund Ruffin Fire Eaters Camp #3000 will meet at 7:00 p.m. on Wednesday, November 1, 2017 at the Bass Pro Shops on Lakeridge Parkway, off Lewistown Road, south of Ashland. Meet at 6:00 p.m. if you desire to eat in the Restaurant to fortify yourself for the heart wrenching actions that will undoubtedly take place at this meeting. BE PREPARED TO VOTE. No, not for Governor, Lt. Governor or Attorney General. No, your votes are needed to elect the Edmund Ruffin Fire Eaters Camp #3000 Officers for 2018! Note this: All members who failed to attend the October Camp meeting were nominated for the Offices of Commander, 1st Lt. Commander and 2nd Lt. Commander. You need to be present on November 1 to protect your interests. There is no telling what can happen with this many nominees for each of these Offices. Do not be caught without appearing to support your cause to the Office you desire, lest you be elected to some other Office, in absentia. With regard to my marvelous, well run, clean and upright campaign for the Office of Chaplin, there is grave and disappointing news to report. All of my campaign yard signs have been stolen, and all bumper stickers have been viciously ripped from the vehicles to which they were attached. The suspects have been narrowed down to Walter Smith, who has frequently expressed his desire to add yet another office to the long list of Fire Eater Offices he holds. However, no proof is available at this point, so no charges are pending. On another front, the application for Robo Calls throughout the area was rejected by the FCC due to the inexplicable action by my Campaign Manager in attaching my Mug Shot to the application. It is hard to get good help. OUR GUEST SPEAKER FOR THE EVENING IS LES UPDIKE, IMMEDIATE PAST 2ND BRIGADE COMMANDER. HE WILL BE SPEAKING ON THE BATTLE OF LYNCHBURG, VA. He is from that area of the State, and has an excellent presentation prepared. The final reason you should attend the November 1 Camp Meeting is to have the opportunity to witness an all out total disaster, thereby departing from the efficient, effective, orderly, disciplined and professional meeting procedures developed and maintained over a period of many years. The Camp Bylaws specify that in the absence of the Commander, the 1st Lt. Commander is to preside over the Camp Meeting to conduct all Camp business. You need to attend this meeting to see the entire meeting dissolve into Chaos and Anarchy, and for the 1st Lt. Commander (whoever that might be) to totally lose control of the meeting and business activities of the Camp within 3 seconds of calling the meeting to order. This could establish a new world record. Be there to witness this travesty of leadership and decorum. You do not want to miss this activity. H ot off the presses!!! The September edition of The First Shot.